Beyond Software is a powerful, web-based project and financial management solution that increases visibility into projects in real time. Developed by the creators of Solomon Software, Beyond Software is designed for small to mid-sized project-driven organizations. By connecting project management tools with financial accounting, Beyond Software increases your team’s ability to efficiently manage time and expenses, and make better business decisions throughout the process. Cash flow is improved through faster and more accurate invoicing and expense management. As a result, projects are delivered on time and on budget. Eliminating the need for infrastructure, and therefore costs—hardware, information systems administrator, backups, etc. Business Intelligence Reports and Consoles: Allows you to quickly and easily conduct self-service analysis with a flexible analytics solution. 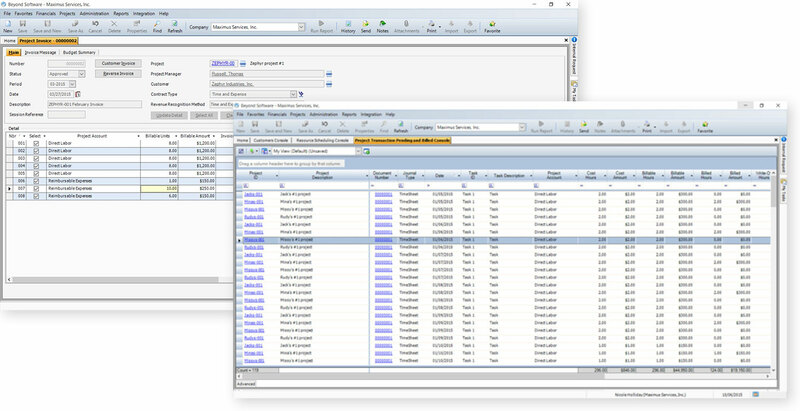 The enhanced reporting and consoles deliver relevant insight into your projects and financials with the option to export the data to Excel for further analysis. Financials: Automates tasks related to bank reconciliation, automate your payables and receivables management, manage cash, increase financial control, record and analyze your financial information. Project Accounting: Set up an unlimited number of projects, manage resources and track all aspects of costs versus revenue so you can proactively analyze and manage projects to profitability. This also allows management review of time and expenses before they are charged to a project to eliminate errors at the source, and where they are the least expensive to correct. Time and Expense: Record employees’ time to the task level on projects, giving you visibility into their work, while improving cash flow and billing cycle times. Employees can submit expenses while away from the office, streamlining employee reimbursement. Document Management: Attach related or supporting documents/files from other programs (such as Microsoft Word and Excel) in all modules. You can also attach a web address (URL) to a record, providing access to information available on the internet/SharePoint etc. For more information about the features and capabilities of Beyond Software, please click here .